 Miso snapper with steamed Asian vegetable mix. The recipe is below (photo courtesy IMUSA). The original inspiration, Nobu’s black cod with miso (photo courtesy Nobu Restaurants). 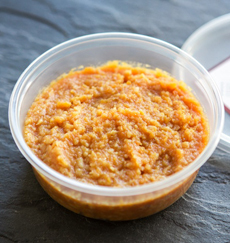 Miso paste can be used in many dishes (photo courtesy Good Eggs). Steamed Asian vegetables. This recipe from Julia’s Album serves them with peanut dressing. 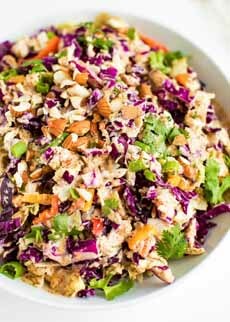 Chopped Asian salad. Here’s the recipe from Eating Bird Food. Miso soup. You can make it (recipe) as a first course to the fish recipe (photo courtesy Sushi Lounge | NJ). 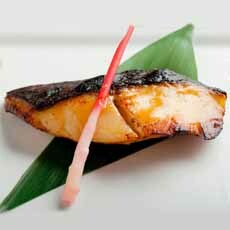 Years back, when Nobu opened in New York City in 1994, we discovered the glory of miso-glazed cod. Black cod with miso is became a signature dish, and as chef Nobu Matsuhisa opened restaurants around the world, the dish went global. We liked it so much, we bought miso and made our own version. Cod has gotten pricey, so we often substitute halibut or snapper. Here are more ways to use miso and the different types of miso. 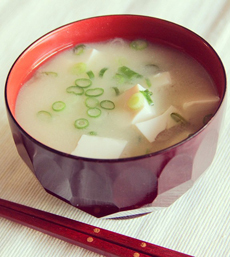 If you like the miso soup at Japanese restaurants, it’s a cinch to make at home. Here’s the recipe. 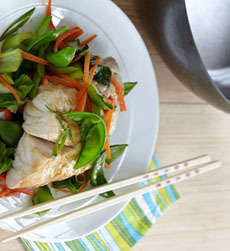 Serve the fish with steamed Asian vegetables and/or an Asian-inspired salad. Ingredients for both are included. 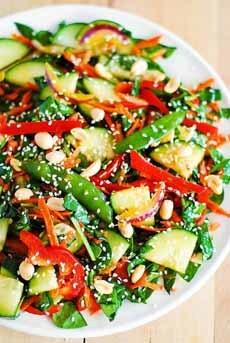 Here are two recipes for the dressing: ginger-soy dressing and Asian peanut dressing. 1. COMBINE the peanut oil, rice wine vinegar, soy sauce and sesame oil in a large bowl. Toss the vegetables (except for the bok choy) in the marinade. 2. COMBINE the miso paste, mirin, ginger and scallions in a separate bowl. Pour over the fish. Allow both the vegetables and fish to marinate for at least 30 minutes and up to 2 hours. 3. PLACE a bed of bok choy in the bottom of a bamboo (or other) steamer and place the marinated fish over it. Discard the excess marinade. 4. DRAIN the vegetables and place in the top portion of the bamboo steamer: carrots first, then peas, topped with chopped bok choy. 5. PLACE the steamer over a 14 inch wok or other steaming device, with 2 inches of water. Bring the water to a boil over medium high heat. Once the water is boiling and steam is visible, reduce the heat to medium and continue cooking for 10 to 12 minutes. Turn off the heat and remove steamer from wok. 6. PLACE the bamboo steamer over a large plate and serve with jasmine rice. The most common type of miso is white miso, made from soybeans, sea salt and fresh organic rice koji*. It is fermented for 6 months fermentation to a sweeter, more mellow flavor than other types of miso (red, black) and is used in marinade, soups, sauces and salad dressings. This recipe is courtesy Good Eggs and Aedan Fermented Foods. *Koji is cooked rice that has been inoculated with a fermentation culture, Aspergillus oryzae. Here’s more about it. †You can use a spice grinder or a mortar and pestle.